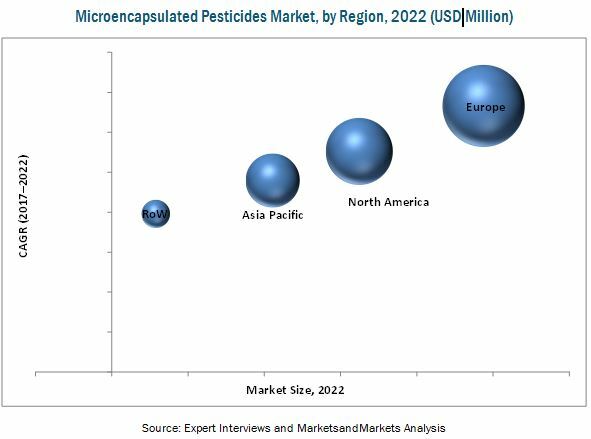 [131 Pages Report] The microencapsulated pesticides market was estimated to reach USD 312.5 Million in 2017, and is projected to reach 539.5 Million by 2022, at a CAGR of 11.54% from 2017 to 2022. Secondary research was conducted to find the value of microencapsulated pesticides market for regions such as North America, Europe, Asia Pacific, and RoW. The key players have been identified through secondary sources such as the United States Department of Agriculture (USDA), United States Environmental Protection Agency (EPA), Food and Agriculture Organization (FAO), and Federal Insecticide, Fungicide, and Rodenticide Act (FIFRA), while their market share in respective regions has been determined through both, primary and secondary research. 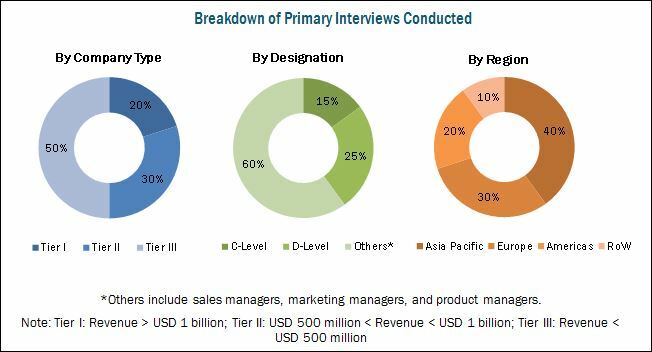 The research methodology includes the study of annual and financial reports of top market players, as well as interviews with industry experts (such as CEOs, VPs, directors, and marketing executives) for key insights (both quantitative and qualitative) for the microencapsulated pesticides market. The various contributors involved in the value chain of the microencapsulated pesticides market include raw material suppliers, R&D institutes, microencapsulated pesticides manufacturing companies as Syngenta, BASF, Bayer AG, FMC Corporation, and Monsanto, and government bodies & regulatory associations such as the United States Department of Agriculture (USDA) and US Environmental Protection Agency (EPA). This research report categorizes the microencapsulated pesticides market based on type, technology, application sector, and region. Further breakdown of the Rest of Asia Pacific microencapsulated pesticides market into Australia, India, and Thailand. Further breakdown of the Rest of Asia Pacific microencapsulated pesticides market into the UK, Portugal, and the Netherlands. Further breakdown of the regions in the RoW microencapsulated pesticides market by Brazil, Argentina, Chile, Israel, Turkey, and South Africa. The microencapsulated pesticides market was estimated at USD 312.5 Million in 2017, and is projected to reach USD 539.5 Million by 2022, at a CAGR of 11.54%. The market is influenced by the adoption of integrated pest management (IPM) practices, along with the regulatory support for sustainable approach to limit excessive agrochemical application. The microencapsulated pesticides market, based on type, has been segmented into herbicides, insecticides, fungicides, and rodenticides. The research & development of microencapsulated pesticides has been mainly concentrated on insecticides. Due to this trend and the registration & commercialization of new varieties of microencapsulated insecticides, the insecticide segment was estimated to account for a large share in the market in 2017. The microencapsulated pesticides market, by technology, has been segmented into physical, physico-chemical, and chemical. The interfacial polymerization technology is widely being used for encapsulation of highly toxic pesticides such as insecticides and herbicides; owing to these reasons, chemical processes accounted for the largest share, in terms of value, in 2016. The microencapsulated pesticides market, by application, has been segmented into agricultural and non-agricultural sectors. The agricultural industry dominated market in 2016, due to the increasing demand for microencapsulated pesticides, which help to reduce the application rate by 10-15 times as compared to traditional formulations such as emulsifiable concentrates and suspension concentrates. Europe accounted for the largest market share in 2016, and is also projected to be fastest-growing in the microencapsulated pesticides market in the next five years. The dominant share of the European region is attributed to the increasing ban on the usage of certain harmful chemicals in European countries, such as France and Germany. The high production costs and farmers’ reluctance to adopt these novel methods in order to gain effective crop yield have been important restraining factors for the market growth. The global market for microencapsulated pesticides is dominated by large-scale players such as BASF (Germany), Bayer AG (Germany), Syngenta (Switzerland), FMC Corporation (US), Monsanto (US), and ADAMA (Israel). BotanoCap (Israel), Arysta LifeScience (US), GAT Microencapsulation (Austria), Reed Pacific (Australia), and Belchim (Belgium) are a few other key market players that also have a significant share in the microencapsulated pesticides market.